MyPet’s Animal Hospital has re-earned their AAHA Accreditation. The American Animal Hospital Association provides accreditation only to hospitals that meet their strict standards. 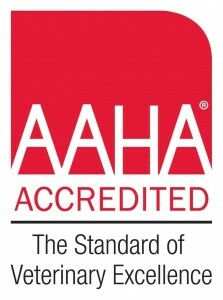 The AAHA Standards of Accreditation, viewed as the standard of veterinary excellence, contain more than 900 individual standards, divided into 18 major sections. These areas of focus include: patient care and pain management, surgery, pharmacy, laboratory, exam facilities, medical records, cleanliness, emergency services, dental care, diagnostic imaging, anesthesiology, and continuing education. Only 12% of all animal hospitals in the United States and Canada are AAHA certified. The purpose of the American Animal Hospital Association is to enhance the abilities of veterinarians to provide quality medical care to companion animals, enable veterinarians to successfully conduct their practices and maintain their facilities with high standards of excellence and meet the public’s needs as they relate to the delivery of small animal veterinary medicine. AAHA Accreditation is a voluntary commitment that veterinary practices make to their clients and patients, and AAHA is the only organization in the U.S. and Canada that accredits animal hospitals based on standards that go beyond state regulations. The My Pet’s Animal Hospital staff is proud to say that we are a part of that 12%, and have been since 2008! We love what we do and we are committed to nothing but excellence for our clients and their pets.